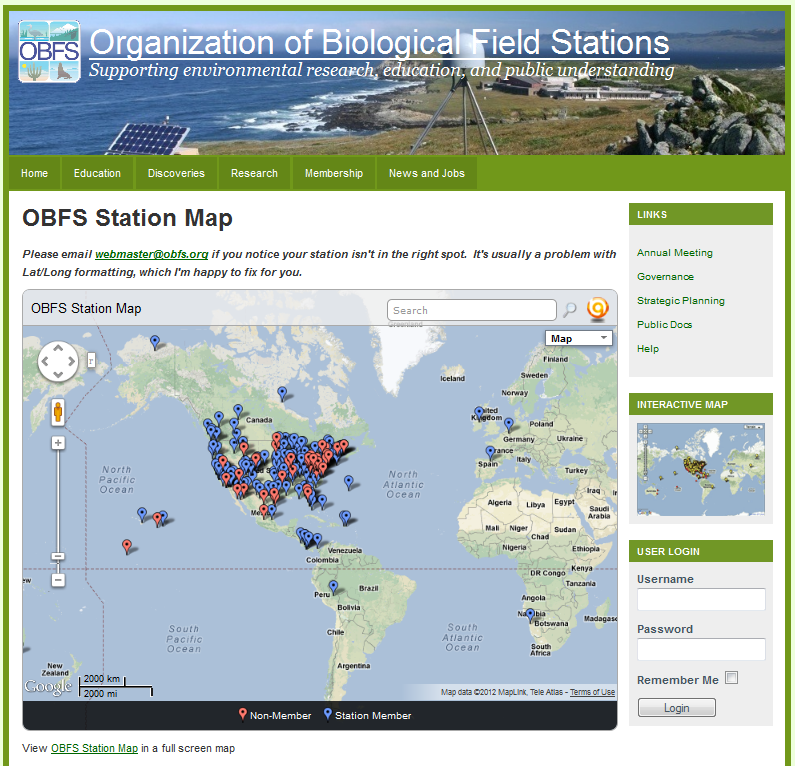 The OBFS website serves the membership in several ways: it is a live membership database; a global map of member stations; and a place to post jobs, summer field course postings, and news items. It is also a repository for member documents and publications. At the beginning of 2009, the OBFS website was hosted on a custom Drupal build on a LTER server. The Drupal system had quite a few custom plugins for managing the membership database, as well as shopping cart and Paypal interactivity. The custom components required weekly monitoring for security updates, and a fair amount of maintenance work. Receipts were not always generated correctly, and international members were not able to use the PayPal system for dues. OBFS does not have any permanent staff, nor an IT support person. In late 2009, the Drupal database was targeted by a SQL injection attack. The first task was to recover the content of the site, and to re-build it on a new secure server. As the OBFS Network Manager, I recommended that they move to a membership management service, which could take care of managing plugins, security, and payment transactions for the society. I served as Project Manager to spec, negotiate, and manage the website migration to a new host, Memberclicks, in 2010. OBFS is now hosted on a Joomla CMS and uses the Memberclicks payment integration system. OBFS now has a clearer audit trail for membership payments, and international members are able to pay via credit card or check. 24/7 support from Memberclicks staff for database issues. OBFS now has the ability to take credit card donations via a portable card reader. Less OBFS volunteer and officer time is spent on database triage, and more time spent on member service and interactions. Membership map is created through BatchGeo, which has Ajax search capability. Created social media channels for OBFS (LinkedIn, Facebook, Twitter) and integrated with OBFS website. Created a Wiki GoogleSite to document how the new system is used.